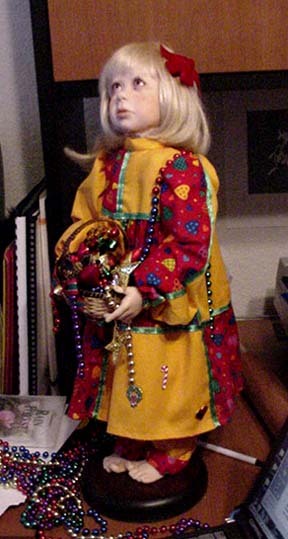 Grace is a 24-inch one-of-a-kind sculpture. 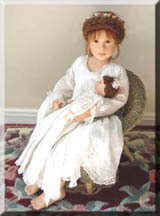 Grace and her baby have delicate faces with brown glass eyes and Grace has a sprinkle of freckles on her face. 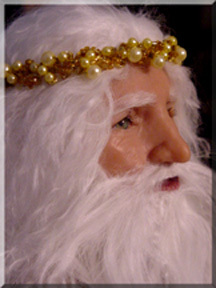 Grace has auburn mohair wig in a braid around her head as does her baby. 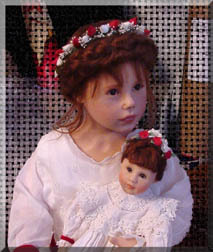 They both have dried rose crowns around their braids. 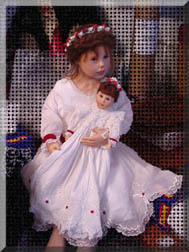 They wear antique cloth outfits with imported lace and ribbons. 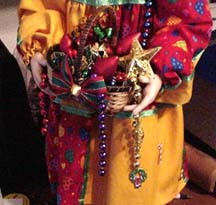 In order to dress Grace for Christmas, hair flowers changed from pink to red, and some red trim was added (red velvet ribbon and tiny red buttons). 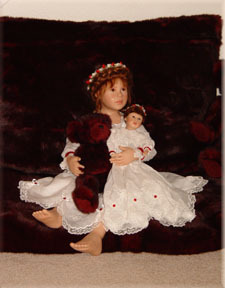 She also picked up a burgundy bear! 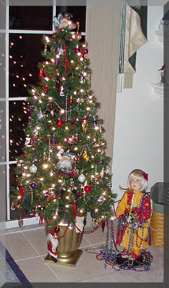 Kara is 20" tall, and stands next to a 3-foot lit Chrismas tree that is decorated with the same garland and decorations that are in her basket. 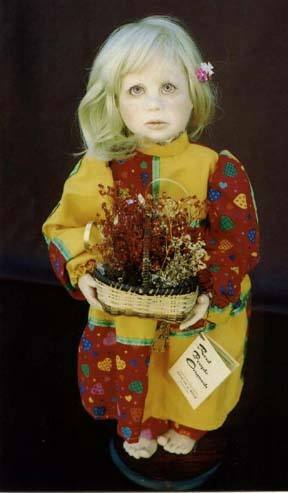 Kara arrived with a basked of dried flowers that had been damaged - Holly turned her into a Christmas doll by filling her basket with Christmas decorations/ornaments, replacing her pink flowered hair pin with a red velvet bow, and adding an assortment of Christmas pins to her dress!